What Really Makes a Static Site Generator? I talk a lot about static site generators, but always about using static site generators. In most cases, it may seem like a black box. I create a template and some Markdown and out comes a fully formed HTML page. Magic! But what exactly is a static site generator? What goes on inside that black box? What kind of voodoo is this? In this post, I want to explore all of the parts that make up a static site generator. First, we'll discuss these in a general fashion, but then we'll take a closer look at some actual code by delving deep inside HarpJS. So, put your adventurer's cap on and let's start exploring. A local server for testing. That's it. If you're thinking, "Hey... I could build that!" you are probably correct. Things start to get complicated though when you start to expand the functionality, as most static site generators do. So, let's look at how Harp handles this. Let's look at the basics of how Harp handles the key ingredients described above. Harp offers more than this handful of functionality, but, for the sake of our examination, we'll stick to those items. First, let's discuss the basics of Harp. By default Harp does not require much in the way of configuration or metadata. It tends to favor convention over configuration. However, it allows for specific metadata and configuration using JSON. It differs from many other static site generators in that file metadata is contained outside of the actual file within a `_data.json` file. While it is configurable to a degree, Harp has certain established guidelines for how to structure files. For example, in a typical application, the files that are served fall within a public directory. Also, any file or folder prefaced by an underscore will not be served. Since much of what makes a static site generator are rules and conventions, the code centers around the actual serving and compiling (for the most part). Let's dig in. While the function looks simple, obviously there is a ton going on within middleware that isn't illustrated here. The rest of this function opens up a server with the options you specify (if any). Those options include a port, an IP to bind to and a directory. By default the port is 9000 (not 9966 as you might guess by the code), the directory is the current one (i.e. the one Harp is running in) and the IP is 0.0.0.0. The details for these defaults are in the command line application source. Staying within index.js, let's take a look at the compile function next. The first portion defines the output path as specified by the call to harp compile via the command line (source here). The default, as you can see, is www. The callback is a callback function passed by the command line utility which is not configurable. The next part starts by calling the setup function in the helpers module. For the sake of brevity, we won't go into the specific code of the function (feel free to look for yourself), but essentially it reads the site configuration (i.e. harp.json). You may also notice a call to something called terraform. This will come up again within this function. Terraform is actually a separate project required by Harp that is the basis of its asset pipeline. The asset pipeline is where the hard work of compiling and building the finished site gets done (we'll look at Terraform code in a little bit). The next portion of code, as it states, tries to prevent you from specifying an output directory that would inadvertently overwrite your source code (which would be bad as you'd lose any work since your last commit). The compileFile and copyFile functions are fairly self-explanatory. The compileFile function relies on Terraform to do the actual compilation. Both of these functions drive the prime function which uses a helper function (fs) to walk the directories, compiling or copying files as necessary in the process. Within each of these folders is a processors folder that contains the code for each specific processor that Terraform (i.e. Harp) supports. 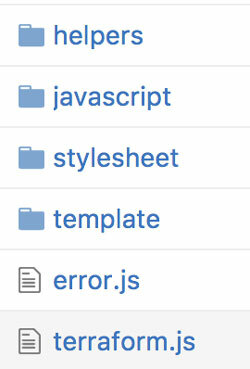 For example, in the templates folder are files that form the basis for compiling EJS, Jade, and Markdown files. I won't delve into the code for each of these, but, for the most part, they rely upon external npm modules that handle the supported processor. For example, for Markdown support, it depends upon Marked. The core logic of Terraform is contained in its render function. The majority of the code in the render function is about handling templates. Things like CoffeeScript and Sass fundamentally render on a one-to-one basis. For example, style.scss will render to style.css. Even if it has includes, that is handled by the renderer. The very end of the render function deals with these types of files. Layouts in Harp, on the other hand, are nested within each other in a variety of manners that can even depend upon configuration. For example, about.md might be rendered within the default _layout.jade (where, exactly, is determined by the use of != yield within that layout). However, _layout.jade might include multiple other layouts within itself by way of the partial support in Harp. Partials are a way of splitting up a template into multiple files. They are especially useful for code reuse. For instance, I might put the site header inside a partial. Partials are important for making layouts within a static site generator maintainable but they also add a good deal of complexity to the logic of compiling templates. This complexity is handled within the partial function of the templates processor. Finally, you could override the default layout by specifying a specific layout or no layout at all for a particular file within the _data.json configuration file. All of these scenarios are handled (and even numbered) within the logic of the render function. To make this digestible, I've skipped over a ton of additional detail. At its core, every static site generator I've ever used (and I've used a bunch) functions similarly: a set of rules, conventions, and configuration that is run through compilers for the various supported markups. Perhaps that is why there are a ridiculous number of static site generators out there. That being said, I wouldn't want to build my own! If you are interested in learning how to build sites using a static site generator, I've authored a report and co-authored a book for O'Reilly that might interest you. My report, simply titled Static Site Generators is free and attempts to establish the history, landscape, and basics behind static site generators. 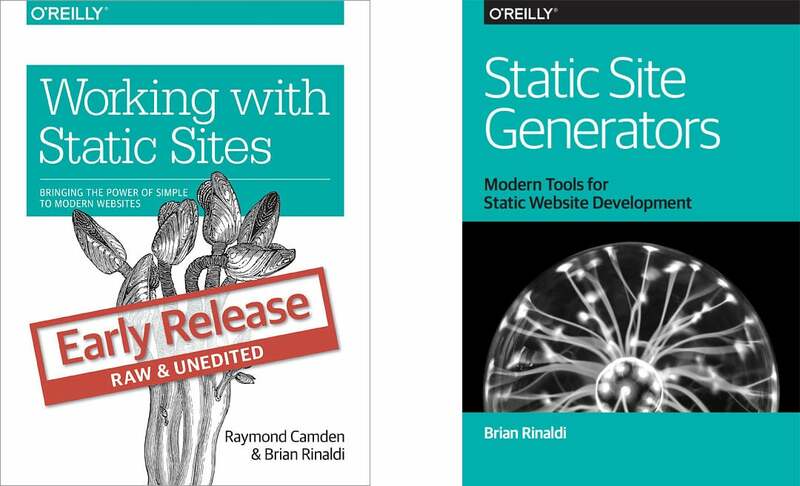 The book that I co-authored with Raymond Camden is called Working with Static Sites and is available as an early release, but should be available in print soon. If you take out the site, it’s basically not that dissimilar from a report generator. It’s run upon event (possibly periodically as that is a really basic event); it pulls from a data source and presents something. What I’m very interested in at the moment (although I haven’t had a client willing to go the journey with me YET) is applying the principles of static front-ends with dynamic back-ends to systems. The lite option is spidering from a dynamic served site a static version, I’ve done that loads, but the real power is in being able to lower cost per visitor, and even server costs by thinking less on the server about non-business critical tasks. Great read; maybe a bit specific on some details. I don’t know guys but, all these generators looks for me like Goldberg machine. You have to install heck of plugins, libraries, compile this, setup paths, learn and use new markup language, and in the end you have got simple website which you can write without all these tools in the same time or even faster. I know i know, this is “Harder, Better, Faster, Stronger” but i miss for the times wher to write site all i need was code editor, knowledge of html css and some js or php, without all these augments. Hey Mark. As a newbie (about 18 months) in the web dev field, I’ve looked at many generators, frameworks, etc. and I still fail to see the benefits. It all seems to me like “one more thing to learn”. I still haven’t found THE generator /framework for me. I seem to be just fine with “only” html, css, js. Hopefully, I can find an employer that feels the same. Thanks Brian for this deep dive into Harp’s core functions, this post is now available in french (https://jamstatic.fr/2017/02/09/y-a-quoi-dans-un-generateur-de-site-statique/) if you wanna link to the translation. @Mark @Jared Today you need to be able to ship continuously. Combining Git versioning and automatic tested builds (done by static site generators) allows to ship safely and continuously. This might not apply to every project.